TriMet has updated its Code that regulates conduct on the transit system to ensure the safety and comfort of our riders and employees. TriMet has updated its Code related to smoking, service animals and other issues. The TriMet Code details regulations governing the use of buses, trains, station platforms, transit centers and Park & Rides. Code updates also include adding new facilities along the MAX Orange Line with the Tilikum Crossing, Bridge of the People and the Lafayette Pedestrian Bridge. •	Smoking is restricted on all TriMet property, and the updated Code adds a restriction on vaping and e-cigarettes. •	The definition of a service animal is being revised to conform with existing U.S. Department of Transportation (USDOT) guidelines. A “service animal” means any guide dog, signal dog or other animal individually trained to work or perform tasks for a person with a disability. 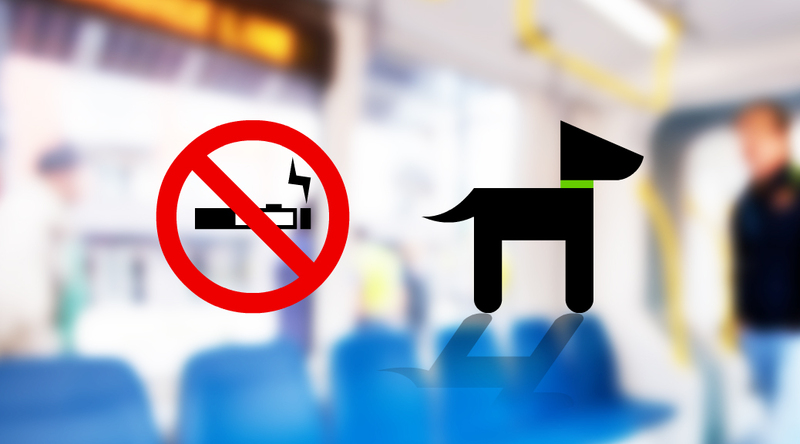 A pet or an animal that solely provides emotional support or companionship is not allowed on the transit system unless it’s in a secure container. In 2011, TriMet updated its Code regarding the definition of a service animal to match new US Department of Justice (USDOJ) guidelines, which define a “service animal” as dogs only. However, the USDOT requested TriMet to delay implementing this definition until it adopted the USDOJ definition. Since USDOT never adopted the USDOJ guideline, TriMet is now returning to the USDOT definition. •	Bicycles can be parked in designated areas, but the updated Code allows for a bike to be impounded if left more than 72 hours. TriMet will attempt to notify the registered owner of an impounded bicycle. •	While two-wheel shopping carts are currently allowed, the Code has been revised to allow four-wheel shopping carts. However, maximum dimensions for all carts are 18-by-18 inches and 30 inches high (excluding wheels and handles). •	New facilities along the MAX Orange Line, Tilikum Crossing, Bridge of the People and the Lafayette Pedestrian Bridge have been added to the Code so the area can be enforced along with all other TriMet property. The Code changes take effect on July 1, 2015. The board approved the changes at its February 25 meeting.